A Different Perspective | Right To Play, Inc.
All children deserve the Right to Play with freedom; without fear, frustration or ridicule. Visualize your favorite playground. Now, can you see the little girl in the wheelchair? She is watching her friends slip down a slide. Silent tears are falling down her face. Over there is a youngster who is blind. He can hear his friends running along a raised platform to get to a fort, but he is afraid to join them. The little boy turned away from you has autism. He wants to play, but there are no quiet areas he feels safe in. These children cannot change the way things are, but Right to Play did. 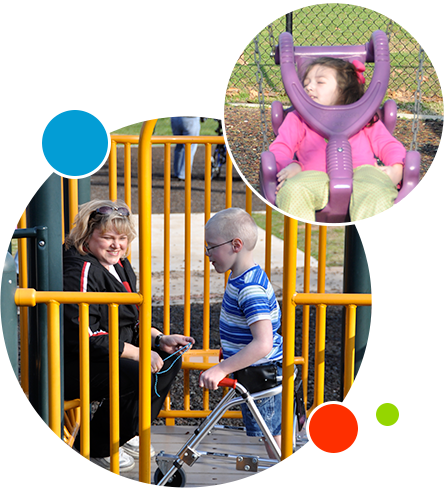 Now imagine a playground where all the equipment is accessed by ramps. Even the elevated areas are wide with walls and handrails, safe for children in wheelchairs. The slides have transfer areas so children can leave their wheelchairs and slide down with a friend, confident the gentle rise at the bottom will stop them. Can you see the smile on the boy with the visual impairment as he plays a variety of outdoor musical instruments? He can even race along with his friend to the tower fort because the walls take away his fear of falling. The child with autism is playing in the quiet cave he found. This playground, the Leaps and Bounds Playground, is the result of thousands of hours of volunteers devoting their time and the foundations, organizations, businesses, and individuals who donated money and materials to make this dream a reality. We continue to need your help. If you live in the area of Northwest Louisiana, join us on our volunteer days or consider organizing a volunteer day of your own. Help us maintain our beautiful raised garden beds and landscaping, remove graffiti, pick up trash and repair damaged equipment. If you visit our Leaps and Bounds Playground, help us stop the misuse and vandalism that is a constant problem. Our musical instruments are designed for outdoor use, but the mallets are constantly being stolen and the instruments are either accidentally or intentionally broken. We are afraid that if the damage continues, we will be forced to remove them. There are lots of trash cans in the playground, please use them. Treat the patrons and the playground with respect. Obey the rules. If you see something happening that shouldn’t, try to stop it or call the police! If you see something broken or that needs our attention call us at 318-865-2793 and tell us. If you don’t live close enough to the Leaps and Bounds Playground to visit and you don’t have a truly accessible playground in your community; design and build one. We knew nothing about designing and building a playground when we started. We only knew we didn’t have a playground where children of all abilities could play together. But we had a dream, set a goal and found a way to achieve it. We won’t say it was easy, but every time we see a child able to play for the very first time at our playground, it makes all the effort worthwhile. You can do it too! !